Explanation: Is it art? Earlier this month, space station astronaut Aki Hoshide (Japan) recorded this striking image while helping to augment the capabilities of the Earth-orbiting International Space Station (ISS). Visible in this outworldly assemblage is the Sun, the Earth, two portions of a robotic arm, an astronaut's spacesuit, the deep darkness of space, and the unusual camera taking the picture. 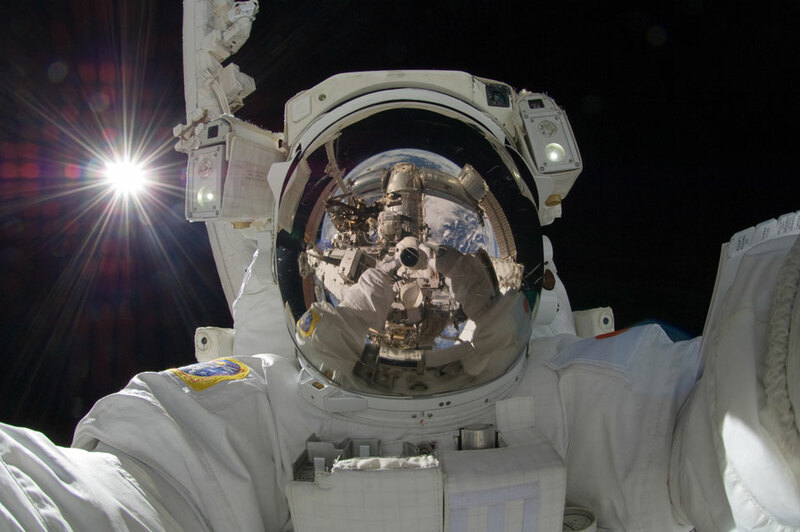 This image joins other historic -- and possibly artistic -- self-portraits taken previously in space. The Expedition 32 mission ended yesterday when an attached capsule undocked with the ISS and returned some of the crew to Earth. What do you think: Is it Art?